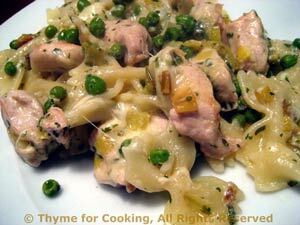 Pasta with Turkey, Leeks and Peas, Thyme for Cooking recipes. This uses my other winter freezer staple: peas. Add some leeks, a bit of turkey, cheese and pasta and dinner is ready. Frozen peas are another under-used vegetable. They are hard to find fresh and, for peas, frozen is better, anyway. The leeks add a mild onion flavor to the pasta and a sprinkle of shredded cheese finishes it. Heat oil in a large nonstick skillet. Add leeks and sauté until starting to get tender, about 5 minutes. Add turkey and sauté 5 minutes longer. Cover, reduce heat and simmer until peas are done and tender, about 10 minutes. To finish: Add the drained pasta, and cook, stirring until heated through and the liquid has either been reduced a bit or absorbed by the pasta. Sprinkle with shredded cheese, stir to combine and serve.